Do Arsenal Have The Blues? Today in Arsenals loss to Chelsea was the win the West Londoners needed to keep an unbeaten premier league record so far this season but if Arsenal got a goal Arsenal and Chelsea could've both been unbeaten in the BPL but Arsenal weren't good enough to keep out the on-form Chelsea FC. Arsenal have only won two games this season against Crystal Palace on BPL opening weekend and Aston Villa two weeks ago while having four draws and one loss today versus Chelsea on Gameweek seven. Arsenal were the better side to start but a mistake from Koscielny that led to a Chelsea penalty scored by Eden Hazard, also a late goal from Diego Costa meant that Chelsea won but didn't play well it was just that they only scored from an Arsenal mistake just like the Galatasaray goal on Wednesday was. But at the end of the day that's what matters. 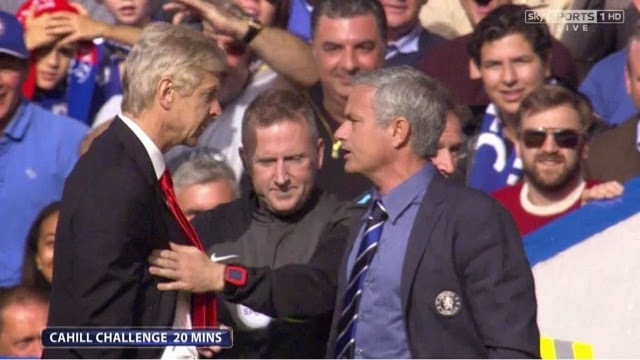 Also the moment of the afternoon came when Arsene Wenger shoved Jose Mourinho in the chest and it was all because of the Cahill challenge where he should've seen Red was it necessary from the Frenchman? Comment if it was or tweet us by using @_TheSportMatrix. Did Arsenal deserve to be Winning, Losing or come out with a Draw? Comment your thoughts below and tell us what your thoughts are. TheSportMatrix • We Live For Sport: Do Arsenal Have The Blues? Arsenal's Premier League unbeaten record has came crashing to an end at the hands of Chelsea.